We’d love your help. Let us know what’s wrong with this preview of Streets of Hope by Peter Medoff. 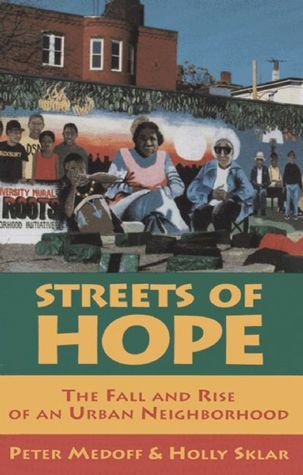 To ask other readers questions about Streets of Hope, please sign up. super interesting, inspiring story. not so well written. worth it, though, i think. A great look at how residents of the Dudley Street neighborhood in Roxbury challenged the typical top-down pattern of urban renewal and gentrification, instead rebuilding their community on their own terms. Nicely detailed and inspiring. If you live in and around Boston, read it - and then go visit! Nothing like a successful case study of community organizing to restore your faith in humanity (and a well-research history of urban disinvestment; targeted, government sponsored ghettoization; and illegal dumping to dash said face against rocks of reason. Kudos to the folks of Dudley Street. May all communities take the stand you took, and with a similar response from government. The case study is interesting and useful, and definitely a forerunner in its level of community participation, but holy crap! Will someone teach these authors about narrative? The book is very poorly written. This is a very inspiring story about community organizing in Boston. It's a bit old, so it doesn't have the group's activities after 1993, but they did some amazing things, including getting the power of eminent domain from the city.